When I was growing up, TV regularly predicted the future with regard to new technology and how it would irrevocably change our lives. We were assured that the rapid pace of technological innovation would mean that by the year 2000, robot servants, artificial intelligence and virtual reality would be everywhere. But the millennium came and went and nothing seemed to change. We got the occasional inkling into the new paradigm: the smartphone; the tablet; inter-active TV. But these were just snazzier versions of already existing media, the phone, the desktop computer; the telly, which had been with us for decades. Six months ago, though, that all changed for me. A traditional 2D filmmaker, I was introduced to the latest development in virtual reality: 360° video. I can tell you the future envisaged in our childhood is here, right now. 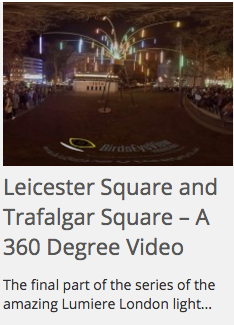 But let me first say, marketing has missed a trick, here, for this isn’t just 360-degree filming: it’s the visual equivalent of surround sound, providing a visual global panorama. For the 7-camera rig doesn’t just pan through the 360 degree of a single complete sweep, it also captures the vista above and below and any angle in between. As an experienced documentary filmmaker I saw the potential for story telling and capturing people’s attention like never before. 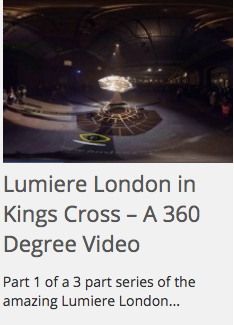 But first the technicalities: there are two ways in which our target consumers can watch a 360-degree production. Either, they view the end product on a 360° player with a 2D screen. Here, consumers become their own director, choosing from moment to moment the angle from which to view the unfolding scenario, by moving their mouse or mobile device around. Or they don a virtual reality headset like we’ve all seen before and immerse themselves in the virtual world. I have to say the first time you put on a headset it takes some getting used to. This is not like Google Glass, where you turn your head and the screen stays in front of you. When you turn your head – or look up or down – in 360-degree, you immerse yourself in the multiple vistas of your surroundings. In my case, I was in a racing car driving out of the factory and onto and around the track. After a while, you really do feel like you’re actually there. Unlike the world of conventional media and advertising, in a 360 degree presentation your target demographic inhabits a world entirely created by you to the exclusion of all other environments and stimuli. In other words, your product; no distractions. This represents a seismic change from the current state of marketing where our media-targeted consumers are blasted with a bewildering array of jingles, product placement and corporate branding, all competing for their attention, while they read the paper; surf the net; or watch television. Don’t get me wrong. Marketers will still have to compete in a vibrant market place to match the target demographic with the product they are likely to buy. The difference is, once there, you are much more likely to hold their attention and for much longer. As we all know, the longer you hold potential consumers’ attention, the better they will become acquainted with your brand; the more likely they will choose to buy it – and continue buying it. In a future interactive scenario, the presentation will actually take the potential customer to a virtual checkout to buy the products displayed in the video. So no longer will marketers have to think in snappy, bite-sized chunks. Having already attracted the exclusive attention of the target demographic, the presentations can be longer and more involved. Marketers already know the value of placing their products in the right genre of movies or television show to raise awareness of their brand and lend it the right caché. In future, we may see feature films or TV series created solely to market products and lifestyle to a particular demographic. Marketers could therefore become the producers, directors and writers of the future. In this respect, it reminds me of the original soap operas from 1920s America. These were radio adverts for soap powder. They featured returning, over-the-top characters; dramatic confrontations and emotionally charged storylines to keep the listeners tuning in and the soap powder brand in their psyche. In the new 360 immersive world, you the marketer will have to create involved plots, glamorous characters and visually arresting scenarios to keep the potential customer in the world you have created, a world in which you have placed your merchandise within his or her reach, in the headset at least. 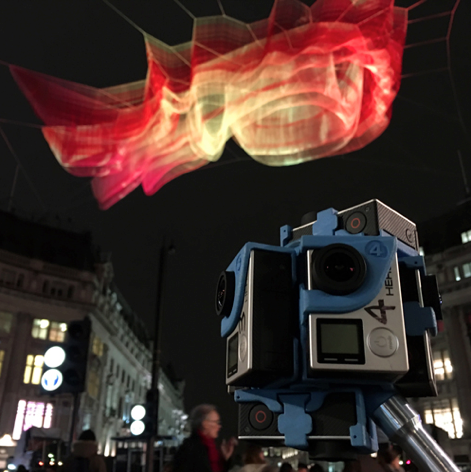 So from a promo-video perspective, 360-degree video creates a product that uniquely and solely captivates the attention of the audience. But it’s not just simple merchandising and sales. 360-degree has the potential to change the way we do business at all levels. Think what it could mean to the marketing strategy of an estate agent. A potential buyer of a property in LA could be based in Dubai, but is instantly transported to the interior of the house he is interested in purchasing, able to peruse it at his leisure as if he really were there. This differs from the walkabout videos we often see on estate agent’s websites because the viewer is not constrained by the single camera angle, shot by the director and then chosen by the editor, to only show off the building at its very best. The potential buyer can get into every nook and cranny so he can make a more informed decision about whether to buy the property in question. In fact, the success of 360-degree will most likely be determined by the resolution of the images enabling the viewer to zoom into the tiniest detail or zoom out to the most spectacular panorama. The potential is not limited to external marketing. It has enormous implications for Human Resources. Potential recruits could familiarize themselves with a future work environment almost first-hand and decide whether it is for them. Recruiters could use it to test how potential employees react in certain circumstances or to certain stimuli. The potential to train new staff cheaply and effectively could be a game-changer. The list can go on and on. 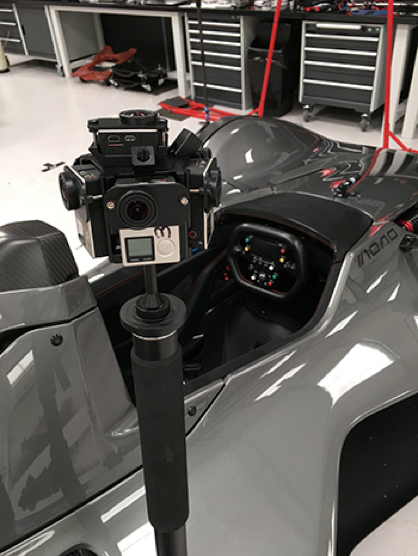 As a filmmaker, I’ve been given enormous insight into the potential difference 360-degree filming can make to the world of documentary and feature film. As a promo-doc maker, I can see it changing the entire philosophy and practice of marketing and therefore business, forever.